An interesting synth that cuts its own sonic furrow and can change identity with the press of a mouse. Straightforward front panel and software- based editing. Completely reprogrammable architecture. Not another analogue wannabe. No power switch. No USB/MIDI interfacing. Whilst the music tech world is alight with an ever growing analogue revival - and it's easy to forget that raw digital technology is still at the heart of the majority of sound generation - analogue doesn't have retro-fetishism to itself. 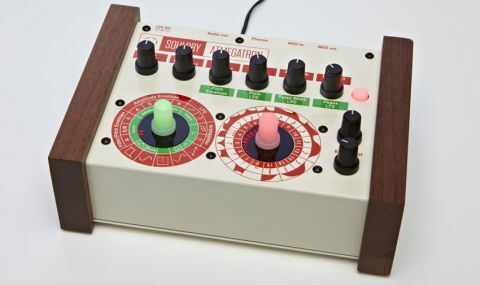 Case in point: the Soulsby Synthesizers Atmegatron has a heritage that extends back to the earliest days of 'home brew' computing. Inside the attractive cream, red and green box (with walnut trim), you'll find an Atmel 328P processor, which is the core of many Arduino development systems. Arduino is an Open Source single-board micro-controller system that allows you to connect hardware with user-programmed software and has been adopted in the music world as a way of creating custom MIDI/USB controllers. "Despite the limited range of controls - and there's no LCD screen here - programming is straightforward once you get the hang of it"
In the case of the Atmegatron, it is used to create a monophonic MIDI synthesizer where audio is generated by modulating a square wave output from the processor. This is not dissimilar to the way in which early computer game pioneers 'hacked' their way into creating music from hardware which was often designed to create no more than the odd bleep. In fact this is at the heart of some of the most creative 8-bit Chiptune programming. There are six hardwired digital controls on the Atmegatron, whilst the rest of the editing is carried out via the two rotary encoders that take centre stage. Despite the limited range of controls - and there's no LCD screen here - programming is straightforward once you get the hang of it. This is perhaps made easier by the fact that most parameters only have 16 different settings (0-15 in 8-bit speak). The single oscillator section is naturally the sonic heart of this synth, with 32 user waveforms and the ability to create (draw) your own via the included patch editing software (another bonus). The pulse-width of this is then modulated before being passed through a filter (with 15 different filter types), amplitude envelope, phaser (which doubles the signal with a delay modulated version), bitcrusher and distortion sections. Additional modulation comes in the form of a filter/ pitch envelope, LFO (with 16 wave shapes), arpeggiator and two portamento modes. External MIDI clock can be used to provide sync information to the LFO and Arp, with the combination of these two making it possible to create the arpeggiated and trill-based effects so beloved of the Chiptune world. These techniques were initially used to overcome the limitations in polyphony and tone shaping of the time. "The unit is certainly fun to use and sounds as gnarly and unrefined as you would expect"
The unit is certainly fun to use and sounds as gnarly and unrefined as you would expect. Make no mistake here, the output of this synth is rarely smooth (and includes a lot of mid-frequency mush at times due to heavy aliasing). The manual, quick-reference chart and tutorial videos posted on the Soulsby website make getting to know the synth pretty straightforward, whilst the patch-editor eases the knob-twisting burden. The build quality is generally good, though we're perhaps a little concerned by the rotary encoders' long-term durability, and we would like to have seen a power switch. It is also a shame that USB/MIDI interfacing was not included, especially as the one thing that makes the £300 asking price more palatable is the Atmegatron's ability to be reprogrammed entirely (by uploading different software via a special cable). We also got to test the Atmegadrum (drum machine), Atcycloctron (wavetable cycling synth) and Atpolytron - 4 note paraphonic synth. They all have a similar sonic stamp to the Atmegatron, but with their own specialisms and quirks. If the asking price puts Atmegatron just out of your reach, then there is a case-less version at half the price, which strikes me as a pretty good deal for home-grown product such as this.